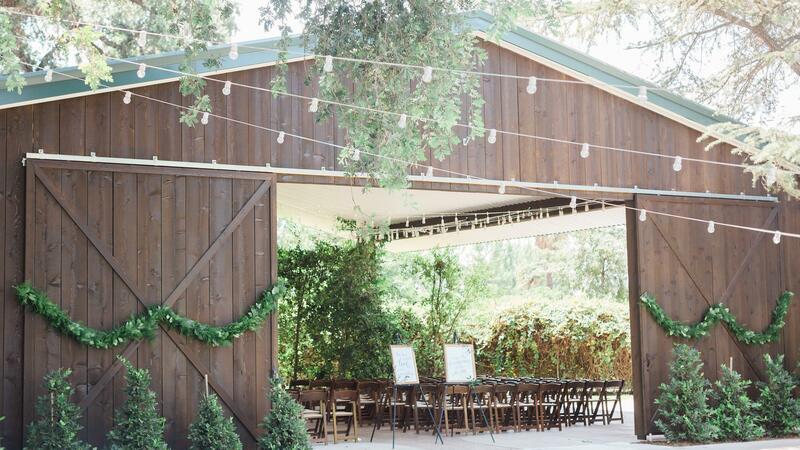 Rent Historic Seven Sycamores Ranch | Corporate Events | Wedding Locations, Event Spaces and Party Venues. Historic Seven Sycamores Ranch offers a blend of the natural beauty of lush gardens and sprawling orange groves with meticulous attention to details. The gardens provide the perfect, relaxed ambiance for your guests—making your special wedding day very special indeed. A beautiful white arbor on the raised pergola embraces the wedding party as a glorious altar among the colorful greenery. The entire grounds transforms into a lush and living theater, with all eyes focused on the bride and groom. Two large arbors of native plants provide pleasant shade and dancing glimmers of sunlight for your reception or dinner. Guests also enjoy strolling the landscaped gardens with many labeled native flowers and plants, and pausing to listen to the sounds of dancing water in the fountains. We are also happy to introduce a new indoor wedding and event space. Formerly a working shop for over 40 years, it has been transformed into a “Vintage Country Barn”. Lined with spectacular glass windows, and gorgeous cedar on the walls, it makes for an impressive setting for any kind of event, from formal black tie or casual country. Skylights over one end give the perfect lighting to an indoor ceremony. The Glass Barn will be available year around, and will has a smaller outdoor garden available for ceremonies, weather permitting. Our professional wedding staff works to assist the bride and groom in selecting from our approved list of licensed caterers and other professionals, and seeing that all necessary needs are met. The Glass Barn hosted its first wedding in 2013, but the building is one of Seven Sycamores oldest and most spectacular. Before its renovation, this open warehouse was alive with noise and movement, of hands packing freshly picked oranges, of trucks idling while boxes were loaded for delivery. Now the Glass Barn houses a different kind of life, that of love and celebration. Balanced by its large wooden pillars and a wall of box-framed windows, the Glass Barn creates a rustic atmosphere that is heightened by its palpable history. In an age of do-it-yourself weddings, the Glass Barn is second to none, and provides a ready environment to complement any style of wedding, from simple to elaborate.